For red sand landscapes, sprawling cattle stations, sacred rock formations, croc-infested waters, ancient aboriginal paintings, and star-studded night skies, Australia's Outback is like nowhere else on earth. Here’s our rundown of the top 10 most mesmerising and memorable experiences in this remote yet accessible wilderness. 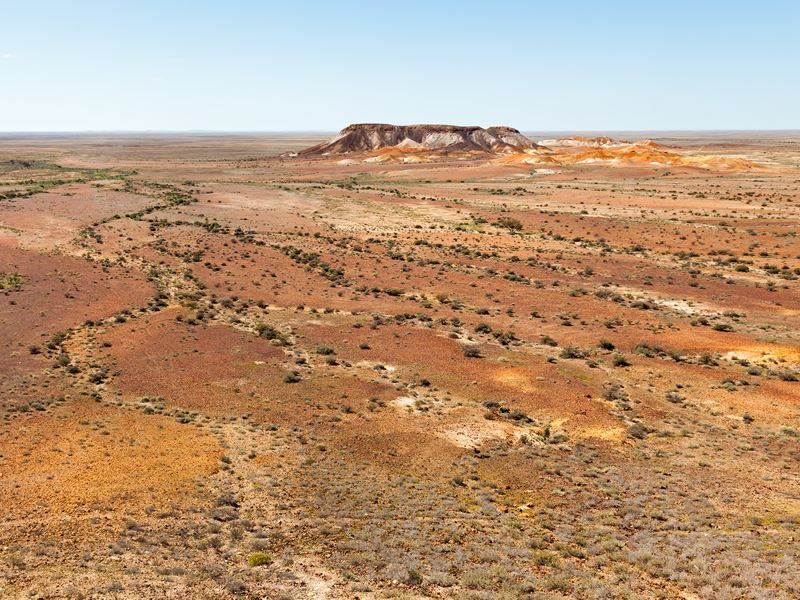 What: Nothing can you prepare you for the otherworldly landscape of Cooper Pedy - the bizarre-looking and very quirky underground town in South Australia’s scorched desert (it translates as “white man in a hole” in the indigenous Arabana language). Founded in 1916, a year after 14-year-old Willie Hutchinson discovered a gemstone in the ruddy-hued mounds of sandstone, this self-styled Opal Capital of the World has lured everyone from have-a-go opal diggers to big-name Hollywood filmmakers (Mad Max Beyond Thunderdome, Red Planet, Ground Zero, Pitch Black, and Priscilla, Queen of the Desert were shot in the surrounding area). Life here is mostly below ground, which is hardly surprising given that summer temperatures hit a blistering 50°C in the shade. The townsfolk live in subterranean “dugouts” (anything from Hobbit-like dwellings to grandiose residences with indoor pools) and many make their living through tourism in the underground boutique hotels, restaurants, bars, shops, and campsites. The best bit: Housed in an original opal mine, the Umoona Opal Mine & Museum at Lot 14 on Hutchison Street is the best place to learn about all facets of opal mining as well as the town’s fascinating history. Highlights include the 90-minute guided tour, the 20-minute The Story of Opal documentary, and the Aboriginal Interpretive Centre. The museum opens daily from 8am to 6pm. 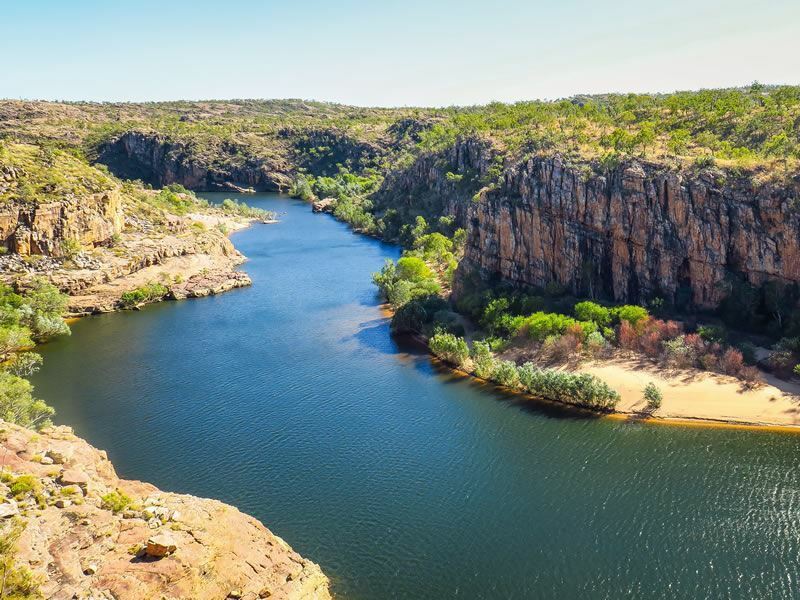 What: Forming the centrepiece of the magnificent Nitmiluk National Park, the billion-year-old Katherine Gorge is a series of 13 steep-walled sandstone gorges carved by the Katherine River through the Arnhem Land plateau. Characterised by sections of rapids, cascading waterfalls, and ancient Aboriginal rock art sites, this awe-inspiring wilderness is of huge ceremonial significance to the Jawoyn people - the traditional owners who now jointly manage the land with the Parks and Wildlife Commission of the Northern Territory. One the best ways to absorb the sheer scale of the place is to paddle your way through each gorge in a canoe or kayak (tours range from two-hour cruises to half-day trips). Best tackled during the dry season when the waters are at their most placid (typically from April to October), you’ll be rewarded with serendipitous sightings of freshwater crocodiles, interesting birdlife (eagles, ospreys, red-tailed black cockatoos, red-winged parrots), and a landscape dotted with dramatic cliffs, broad valleys, and swimming holes. The best bit: Back on dry land, the Visitor Centre’s Display Centre & Heritage Museum located at the entrance of Katherine Gorge houses large-scale topographical models, informative audiovisual displays, historical memorabilia and photography, and Aboriginal artefacts. You can also buy lovely souvenirs and crafts handmade by the Jawoyn people. What: Given that Australia’s Outback is rich in dark and remote places, there really is nothing like watching the unobscured night sky in all its awe-inspiring glory. Some of the best DIY stargazing spots where you’re guaranteed no light pollution are Warrumbungle National Park in New South Wales for its dark sky park (the country’s first), the Cosmos Centre in Queensland for its nightly activities with high-powered telescopes, and Ayers Rock Resort in the Northern Territory for its state-of-the-art guided tour of the universe - and beyond. Further highlights where you can check out the meteorites and the Milky Way include the Arkaroola Wilderness Sanctuary in South Australia's Flinders Ranges and the beautiful Lake Eyre in South Australia’s Outback (when filled, the water reflects the sparkling lights from above). Equally trip-worthy is Broken Hill in New South Wales for its cinemascope-like desert and jet-black black skies that go on forever (book the one-hour Sky Show to learn about famous stars and constellations). The best bit: The award-winning Yellow Water Under the Stars at Kakadu National Park is a unique 90-minute nighttime cruise that provides greater insight into the treasure that is the Yellow Water billabong. Led by an Aboriginal guides who are taught the secrets of Kakadu by tribal elders, you’ll get to learn about the sky's spiritual and cultural connections with the landscape. What: Spread over Western Australia’s entire northwestern corner, The Kimberley is truly one of the world’s last wilderness frontiers. 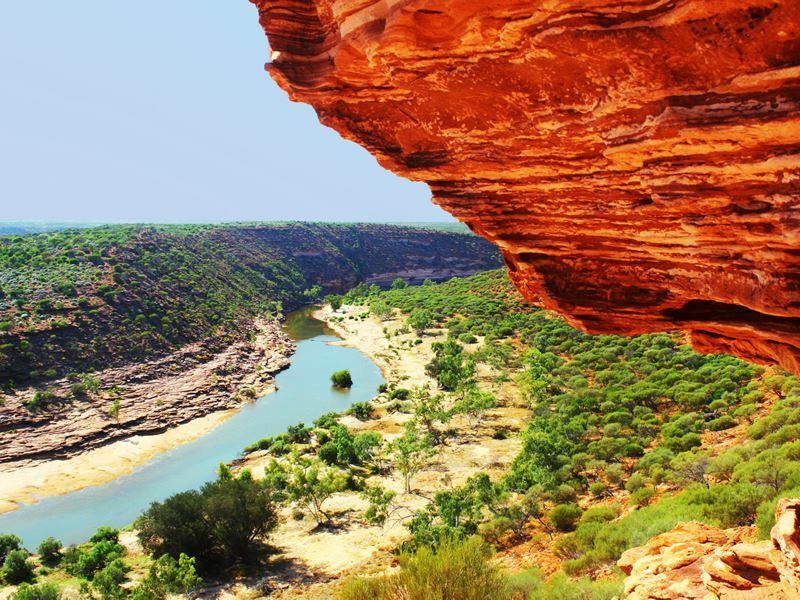 Roughly the size of Britain, it comes with rugged gorges, epic waterways, majestic canyons, freshwater swimming holes, several Outback stations, and some of Australia's most iconic places to saddle up and explore. Little wonder, then, there’s plenty of equestrian tours available - most of which offer half-day, full-day, and multi-day rides as well as one-to-one or group lessons. Some of the most authentic riding experiences can be found at Home Valley Station, the 615,000-acre adventure playground that featured in the 2008 movie Australia starring Nicole Kidman and Hugh Jackman, and at Digger's Rest Station, the former 1930's staging post for Afghan cameleers travelling along the Karunjie Stock Route. Both operate as working cattle stations and offer reasonably-priced horse trekking tours that cater for all skill levels (children and adults) during the day or at sunset. The best bit: The hub for most of the activities on offer at the 700,000-acre El Questro, the much-celebrated El Questro Station is perfect for those wanting a saddle-friendly trek around the region’s mud and salt-flats, rainforests, and cascading waterfalls. Head here to join a small group on a daily two-hour afternoon tour - or book one of the off-the-beaten-track overnight rides. 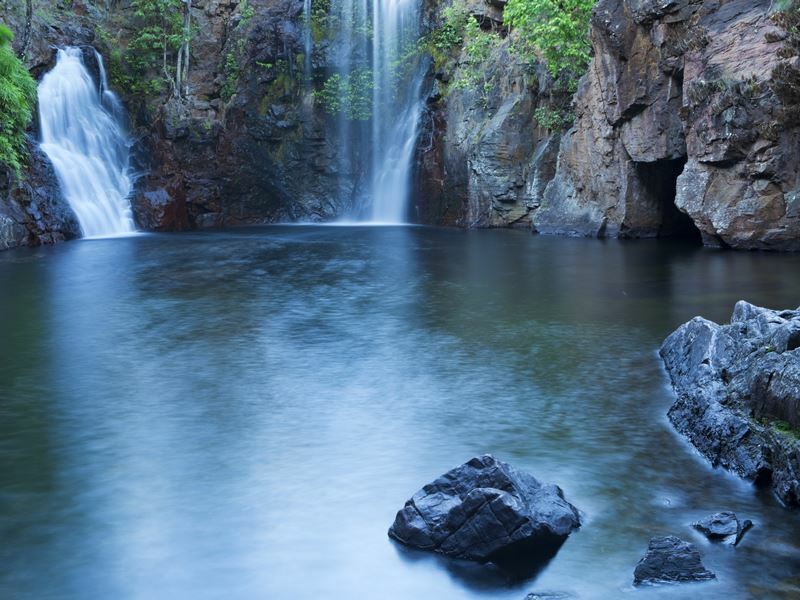 What: Quite possibly the most impressive place to take a dip in the Top End, the 1,500-kilometre-squared park just a 90-minute drive from Darwin rewards with an inordinate amount of crystal-clear waterholes, bathtub-warm springs, and cascading falls dotted around a desert-like landscape. Most famous is Florence Falls for its spectacular double waterfall and idyllic swimming hole (simply follow the 160-step staircase down to the swimming area or head to the viewing platform at the top if you don’t fancy getting wet), and Wangi Falls where the lush monsoonal rainforest leads to a postcard-perfect spot for an invigorating dip or splash-around. Equally noteworthy is the Buley Rockhole where you can take your pick from a series of rapids, shallow rock ponds, or deep plunge pools surrounded by wonderful bushland. Most of the park’s lovely swimming spots are open during the dry season, but be prepared for closure in the event of extreme weather or warnings of dangerous croc-infested waters. The best bit: One of Litchfield’s best-kept secrets, Tjaynera Falls is reached only by a four-wheel drive and short hike (around 30 minutes) from Tjaynera/Sandy Creek Falls. But the payoff is worth it; not least for the never-crowded crystalline plunge pool at the base of the falls. Once you’re done with swimming, spend the remainder of the day soaking in the open valley views. What: So long as you have a four-wheel drive, the Gibb River Road (known as The Gibb) is accessible to any adventurous motorist wanting to experience the wide-open space of Australia's vast Outback on two wheels. Easily one of the country’s most epic routes, this 410-mile-long track cuts right through the wild heart of the remote Kimberley as it takes you from Derby on the west coast to Kununurra (or Wyndham) on Western Australia's eastern border. Along the way, you’ll get to see everything this region is famous for: ancient landforms, mountain ranges, dramatic gorges, gorgeous creeks, rock pools and waterfalls, huge cattle stations, crocodile-filled waters, and rock art galleries covered in mythical Aboriginal figures. The trick is to take things nice and slow, bearing in mind that you’ll be mostly be driving on gravel, heavy corrugation, small stones that can easily puncture tyres, or just plain rock. Since road closures are quite common, especially early in the wet season, pack precautions such as water and long-life food. The best bit: There are two best ways to do this journey, both of which have their advantages. Travelling east to west you’ll end up at Broome’s Cable Beach - the iconic 14-mile-stretch of brilliant white sands fringed by the dazzling Indian Ocean. Travelling west to east gets you close to Kununurra and the incredible Bungle Bungle range of the Purnululu National Park. What: Staying “crocwise” is crucial at Australia's largest terrestrial national park, especially for those venturing anywhere near the floodplains, freshwater billabongs, creeks, rivers, and coastal areas. 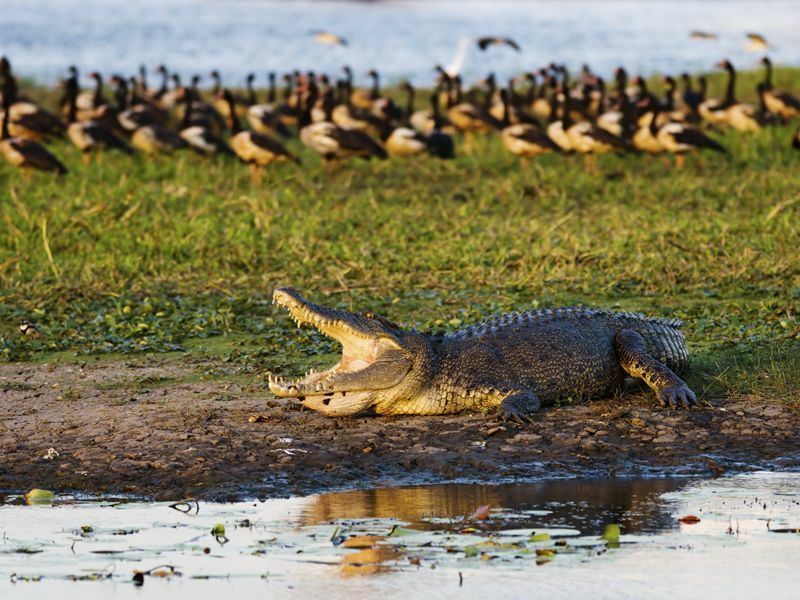 At least 120 saltwater crocodiles call the six-kilometre area south of Cahill's Crossing home, with dozens of these snap-happy creatures congregating to this notoriously dangerous body of water at the end of each dry season to feast on fish. However, in spite of the countless (and rather scary) warnings issued by Parks Australia, crocodile-spotting is perfectly safe if you stay well away from the water. There’s around 10,000 crocs in Kakadu (excluding hatchlings) and the coolest way to watch them in action is from the free-to-use viewing platforms location at Cahills Crossing and Yellow Water (the best time to see concentrations of crocodiles is between August and November). Alternatively, choose from two cruises - the Guluyambi Cultural Cruise and the Yellow Water Wetlands cruise - both of which are run by Aboriginal guides. The best bit: For Insta-worthy shots of crocodiles slithering, swimming, or sunning themselves on the bank (hopefully not leaping and lunging), sailing down the East Alligator River is the highlight of any cruise. During the balmy summer months, the Guluyambi Cultural Cruise sails upstream on the Magela Creek and is one of the safest ways to see crocodiles in the wild. What: The superstar of Australia’s Red Centre, Uluru (formerly known as Ayers Rock) is the Northern Territory’s geological wonder rising 348-metres above the surrounding desert plain. Watching this sandstone icon change colour from salmon pink to orange to burgundy at sunrise or sunset is a bucket-list must, whether it’s walking around the base with an Aboriginal guide, taking a helicopter flight, or riding a camel on an organised safari. Many make a beeline for Ayers Rock Resort to experience Sounds of Silence - an intimate outdoor buffet under the star-studded Outback sky. 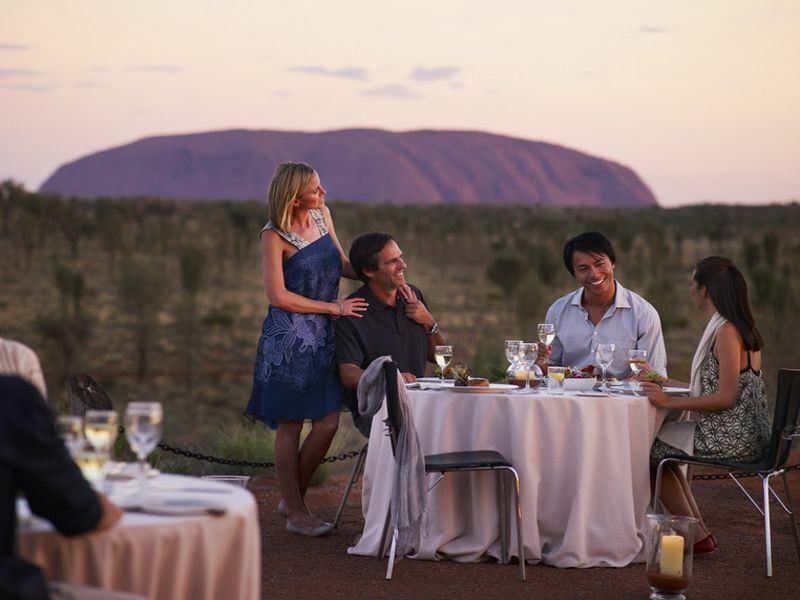 Complete with its own entry in the Australian Tourism Hall of Fame, this four-hour feast begins with canapés and chilled sparkling wine served on a viewing platform overlooking the Uluru-Kata Tjuta National Park. The best bit: As darkness falls, you and your fellow diners will enjoy a didgeridoo performance, three courses of inspiring cuisine created with native bush ingredients, and all the wine and beer as you can drink. After dinner, the attention turns to the night sky as a resident astronomer decodes the stars and planets before tea, coffee, and port is served (in the winter you'll gather round the campfire for a few glasses of mulled wine). 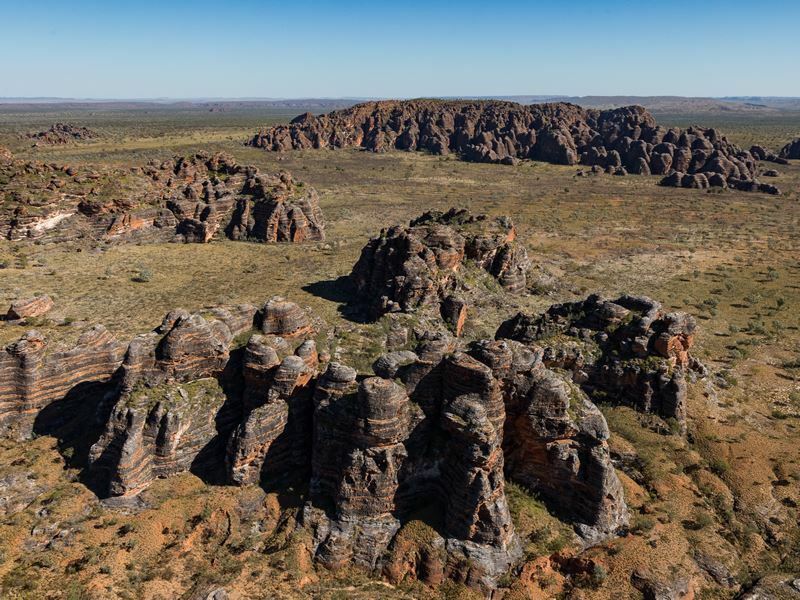 What: Approximately 440 million years in the making, Kings Canyon is the Lost City-like sandstone wonder in the heart of Australia's Red Centre that rises 270 metres above sea level and soars over a dense palm forest filled with 600 species of native plants and animals. 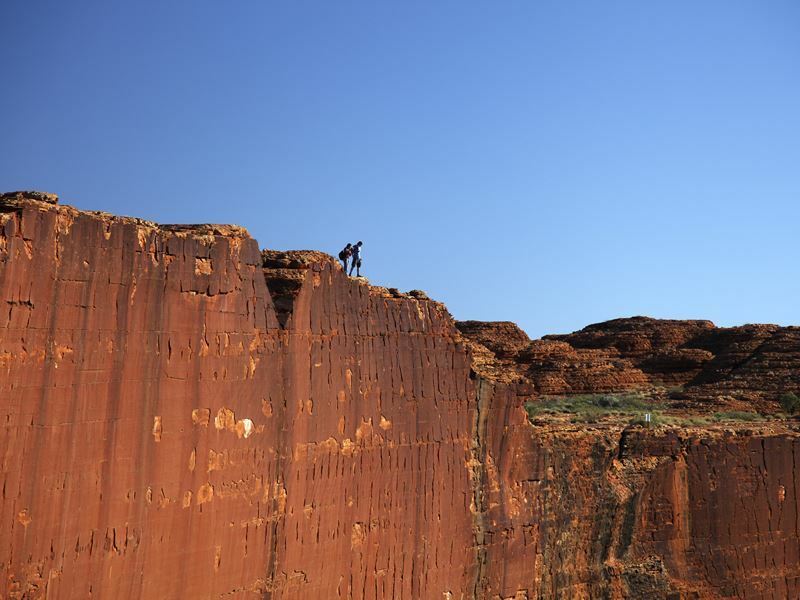 While viewing this icon from ground level is superb, nothing beats the challenging six-kilometre-long Kings Canyon Rim Walk at sunrise or sunset (it takes three to four hours and is suitable for fit walkers able to take on an initial climb up of around 1,000 steps). Following a path marked by blue diamond signposts, highlights include Priscilla’s Crack (a path between rock walls made famous by the 1994 movie Priscilla, Queen of the Desert) and the Garden of Eden - a shady green oasis with a waterhole (the traditional owners deem this place sacred so swimming is not allowed). Once you’re done admiring the spellbinding landscape, you’ll use almost a mirror image of the ascending staircase on your way back down. The best bit: Taking a guided rim walk with an Aboriginal elder is the best way to learn about the significance of the area to its traditional owners. You’ll also learn how the Ulpanyali and Lilla indigenous people consider the Garden of Eden a sacred place for men whose Tjukurpa (Dreaming) stories are far too sensitive to share publicly. 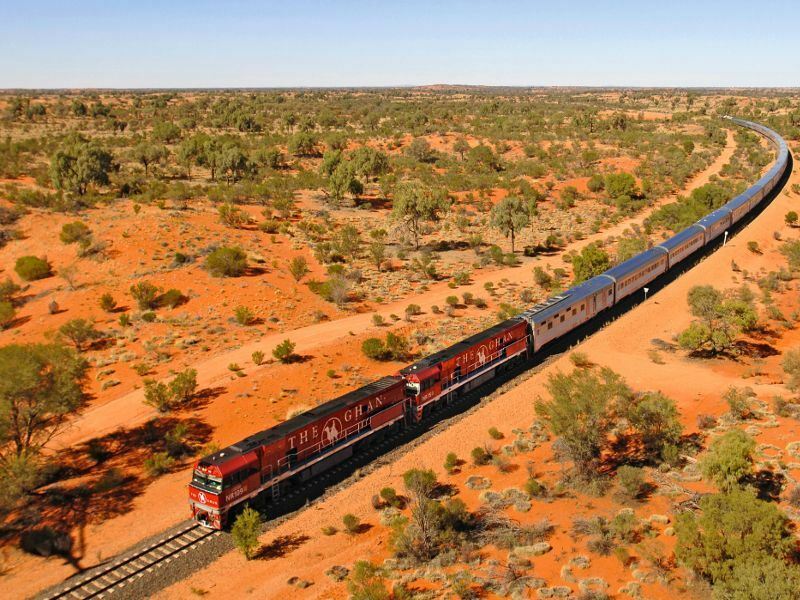 What: Named in honour of the Afghan camel drivers who once explored this area, the Ghan is the Australian passenger train that crosses 1,861 miles of rail track from the south coast to the north coast (the journey takes a total of three days). You can hop on in Adelaide, watch South Australia's rolling green hills make way for desert, marvel at the fiery Red Centre, and soak in the tropical splendour of Top End. Alternatively, board at Darwin to see the landscape at its dramatic best the opposite way (at present there are two trains a week in each direction). Highlights include a whistle-stop tour of Alice Springs and Katherine, a scenic helicopter flight over Simpsons Gap, a cruise down the Katherine Gorge, and a stop at the opal-rich Coober Pedy. If you’re short on time, the Pichi Richi Railway is a great way to explore the timeless Flinders Ranges. Both full-day and half-day trips are available aboard a restored steam or heritage diesel train on the original Ghan route between Port Augusta and Quorn. The best bit: Throughout the trip from one end of the continent to the other, the train offers 330 or so guests a very decent level of comfort. There’s Gold or Platinum Cabins with shared or private bathroom facilities, fine dining at The Queen Adelaide Restaurant, and the Outback Explorer Lounge for drinks and snacks. Both the following tours assure top-notch sightseeing aboard the Ghan: Ayers Rock & The Ghan and Darwin to Adelaide on the Ghan.